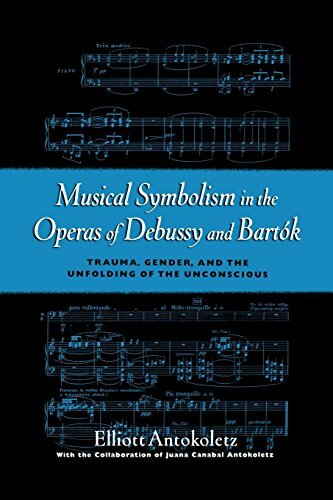 Musical Symbolism in the Operas of Debussy and Bartók explores the means by which two early 20th century operas - Debussy's Pelléas et Mélisande (1902) and Bartók's Duke Bluebeard's Castle (1911) - transformed the harmonic structures of the traditional major/minor scale system into a new musical language. It also looks at how this language reflects the psychodramatic symbolism of the Franco-Belgian poet, Maurice Maeterlinck, and his Hungarian disciple, Béla Balázs. These two operas represent the first significant attempts to establish more profound correspondences between the symbolist dramatic conception and the new musical language. Duke Bluebeard's Castle is based almost exclusively on interactions between pentatonic/diatonic folk modalities and their more abstract symmetrical transformations (including whole-tone, octatonic, and other pitch constructions derived from the system of the interval cycles). The opposition of these two harmonic extremes serve as the basis for dramatic polarity between the characters as real-life beings and as instruments of fate. The book also explores the new musico-dramatic relations within their larger historical, social psychological, philosophical, and aesthetic contexts.